The Walking Dead shed another portion of its audience with its midseason finale on Sunday night. The AMC series nabbed an average of 7.9 million viewers, earning a 3.4 rating in the key 18-49 demo in live-plus-same day returns per THR's report. With non-stop chatter since the episode aired, mostly surround the major character's death, the live+3 numbers will likely see a monstrous improvement. 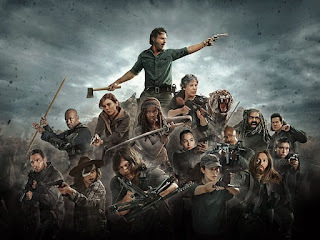 Live+3 improvements have been the case recently for the AMC series, with Episode 8x07 jumping 45% in viewership by adding the fans watching on their own time reaching 10.7 million.